Hortus Camdenensis | Boronia fraseri Hook. 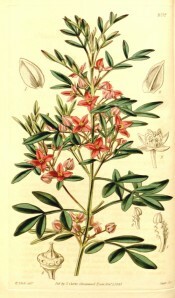 Shrub with pinnate leaves, with three or five narrowly lance-shaped leaflets, and axillary clusters of deep rose-coloured flowers. To 1m. [RHSD, FNSW]. ‘Seeds of this pretty New Holland plant were imported by Messrs. Loddiges’ many years ago; but though they germinated at once, the plants did not blossom till within the last two years, and we had our drawing made from the collection of these gentlemen in the month of May or June, 1841.’ [MB p.123/1842]. ‘This is the handsomest of a very handsome Genus, and appears to have been introduced to our gardens from New Holland, having been recently figured in Mr. Paxton’s “Magazine of Botany,” under the name of B. anemonfolia, and it is presumed intended for the plant of that name published by Allan Cunningham; although, as is the custom with that Work, which, it must be acknowledged, takes away much from its usefulness, no synonym, or reference, is given. The plant, however, is wholly at variance with the B. anemonifolia of A. Cunningham: nor does it appear to be a species taken up by any other author ; but is unquestionably one, of which I find fine specimens in my Herbarium, from the late Mr. Charles Fraser, which that indefatigable Botanist collected, and noted as "Boronia, a native of ravines on the banks of the Nepean River. Its height three feet. Observed in flower in September. Rare." - With us it grows freely in a common greenhouse, and is readily increased by cuttings; and its deep rose-coloured flowers are produced in the spring months.’ [BM t.4052/1843]. Only listed in the 1857 catalogue [T.166/1857]. 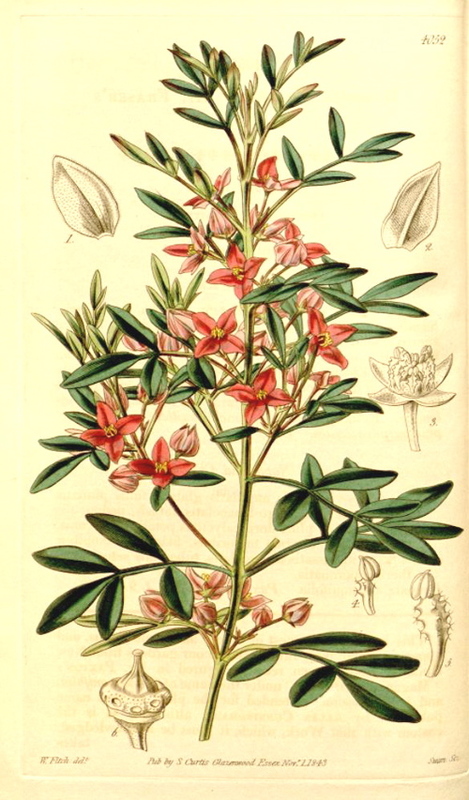 The identity of this plant is unclear as the early literature confuses two plants under this name, Boronia anemonifolia A.Cunn. which see, and B. anemonifolia Paxt., a synonym of B. fraseri Hook., a plant introduced by Loddiges’ Nursery and sold under the name B. anemonifolia. Whichever plant was grown Macarthur is likely to have sourced it locally and may have collected it himself. Boronia fraseri is found near the coast and adjacent plateaus and along the Nepean River, country in which Macarthur collected, while Boronia anemonifolia is found in the upper Blue Mountains where it could have been collected by John Bidwill. More details about Boronia fraseri Hook.